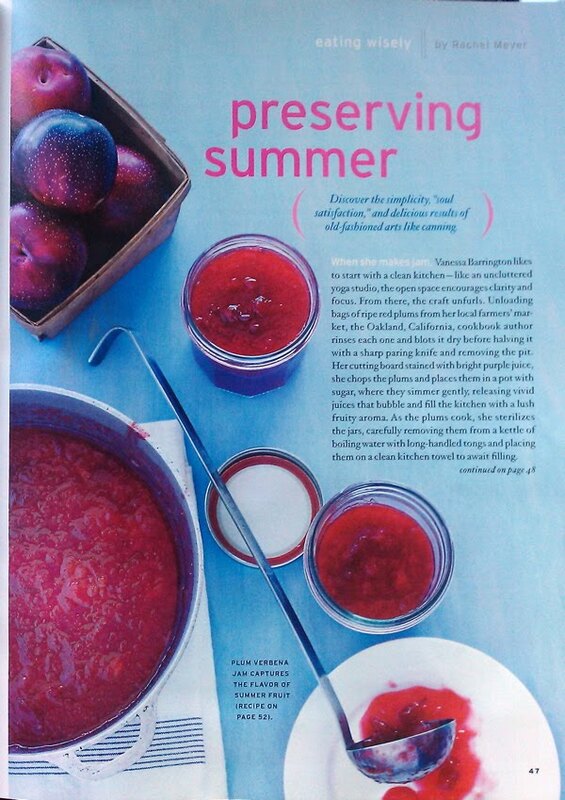 My recent Yoga Journal article on urban homesteading, "Preserving Summer," is now online, just in time for late summer harvest. Head on over for this quick read from the June issue, including interviews with cookbook author Vanessa Barrington, chef Samin Nosrat, recipes for Bread and Butter Pickles, Plum Verbena Jam, and a little old-fashioned yoga philosophy to ground it all out. Forward-thinking city dwellers are increasingly "urban homesteading," reclaiming traditional kitchen crafts like canning vegetables, preserving jams and jellies, pickling, raising chickens for eggs, keeping bees for honey, and crafting homemade cheeses. .... Though this might seem radical to those of us who've grown accustomed to buying packaged food at the grocery store, it represents a return to the natural cycles of life. Preparing homemade foods like preserves and cheese, [chef Samin] Nosrat says, has many parallels with her Anusara Yoga practice. Both call for slowing down and breathing through the temptation to rush through the steps. Both require dedication to the practice, the over-and-over hands-on do-ing that is a part of the learning curve. Both mean seeing setbacks as opportunities to learn from, and recognizing that ease and mastery come with time and repetition. 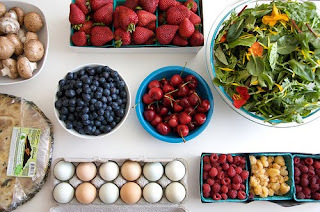 Grounding herself in an abundance mentality, knowing there is always enough, she is reminded of the power of just paying attention, of being present with the practice itself, whether it's on the mat or in the kitchen. Read the whole thing, learn a little about Plum Verbena Jam, and meet sweet kitchen yogis Molly Ruhlman and Jordan Huffman in the process. Their practices inspire my own, in more ways than I can count. This time of year aways makes me think of corn on the cob, husked on the front porch in the humid August evenings on the prairie with my Pops and my sisters, and of the big heavy melons ripening in the garden up the hill. Sink into the season, taste it in the freshness of your homegrown tomatoes and your backyard squash, and let it be just one more way to live well, presently, mindfully, richly in this body that is yours for just this brief moment in time.